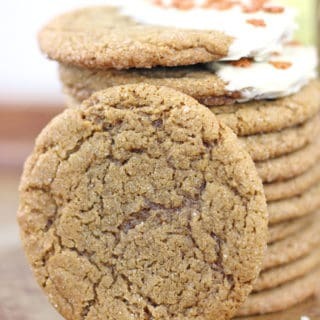 These Gingerbread Cookies will get you feeling festive and make your Christmas Cookie Exchange clamor for the recipe! Given to me by a family friend, they have won three cookie competitions in less than 10 years! Cream the butter and 1 cup sugar. Add the egg and beat until fully incorporated. Add the orange juice and molasses (I use light molasses) until combined. Refrigerate for 2-3 hours, if you can't at least put it in the freezer for a half an hour. In about 2 tablespoon balls, roll into the 1/4 cup sugar and flatten so it looks like the thickness of a double stuff Oreo, really thick but clearly flattened.